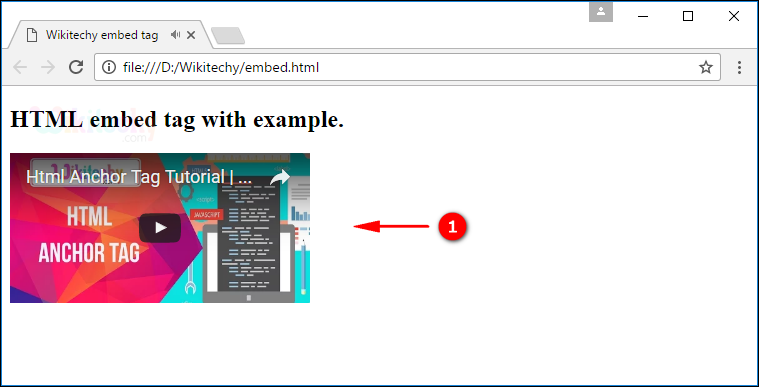 The <embed> element is used to describe a container for an external application or interactive content. The <embed> tag support the Global Attribute and Event Attribute. In the content categories are flow content, phrasing content, embedded content, interactive and palpable content. HTML 4 does not support <embed> tag. HTML 5 support <embed> tag. The <embed> tag is used to container for the YouTube video. src attribute used to define the source URL for the embedded content. The output shows the YouTube video embedded to the document. src URL No Yes It specifies the address of the external file to embed. width pixels No Yes It specifies the width of the embedded content. type media_type No Yes It specifies the media type of the embedded content. height pixels No Yes It specifies the height of the embedded content.